Resident Eric Butcher wrote a very thoughtful, detailed piece and sent it to our board members, and local media, answering the false statements we also feel were made by our assemblyman on July 6, 2015. Several board members were swayed by these statements, and Mr. Butcher goes line by line and shows how each one is so easily proven false, it’s a wonder how a sitting state legislator could make them. Last Monday evening, Rep. Weatherston came to speak, and he made several claims throughout the night that seem to be untrue. I wanted to address some of these statements, as they appear to have affected the vote of several members. Oak Creek/Franklin have virtually the same demographic, and income levels as Caledonia would have. In the 2013-2014 school year, they received $5,000 per student in state aid, and over $500 in federal aid. Caledonia would likely get just under this amount, perhaps a few hundred dollars less. Not “virtually none.” In fact, only one district, Washington Island gets none, because they have an average house value over $3 million! This information is readily available on the DPI website, but our state representative said the opposite. Why? Weatherston also claimed that if the law where changed, it would create a constitutional crisis that would could “allow Kenosha to split and become part of Illinois.” I was shocked to hear this, and so were the people next to me. Does Weatherston not realize that the boundaries of Wisconsin are determined by the federal government. The proposed changes, as Mr. Weatherston should know, are to amend WI statute 117.105, governing “creation of a school district.” It’s already law to allow “secession,” but the process currently gives veto power to the bureaucracy we’re trying to separate from. The changes proposed by the CCSD people are to make that final say rest with the people of Caledonia. Mr. Weatherston could only have made up his statement, for what reason and for what purpose I can only assume again that he is in fact against this idea on the whole. The fact that several members of the board appeared to accept this concern was even more upsetting. It means none of you have reached out to Sen Wanggaard or Speaker Vos about this, or researched the issue with due diligence. You’ve been given a year to do so, and my friends and neighbors appear to know more than you do. This is disappointing. For some reason, Weatherston also claimed that Unified was “the only unified district without numbered seats.” Why would he say this? Our neighbor KENOSHA has the same system! Plus, at least a dozen others. I searched online, and Antigo, Beaver Dam, Stevens Point and others are the same way. How could a state representative so brazenly state something so easily proven wrong? Weatherston pushed a new thing no one had EVER heard before, and that immediately should make you wonder about his intentions: he claimed that the Speaker and other leaders wanted a study far greater, more broad and far more expensive than was requested. Mr. Prott and Mrs. Trentadue actually said this was their reason for voting no. But a call into the Speaker’s office and discussions with Sen Wanggaard have proven this false as well. Our leaders have been assured that an updated version of the 2009 study is all that’s required for this step. SO GET IT DONE! Let me ask, how many of you have called Speaker Vos or Senator Wanggaard? I doubt any of you have, other than President Bradley, who the Speaker said he has told this to. Finally, he made a claim that President Bradley has also made. “Caledonia probably cannot afford it.” Mr. Bradley has made several statements to the media and to others like this. Yet, he has no study to back it up. Which is why we want the study. The only indication that he has that Caledonia cannot afford what nearly 400 other Wisconsin districts seem to afford (despite being SMALLER than us) is what Mr. Weatherston has repeatedly said. Yet, he doesn’t have any proof of this either. In a previous meeting, Weatherston actually said, “according to a study my office did, this may actually double taxes.” When asked about this “study,” he could not provide details, or what sources he used, other than “a glance” at the 2009 study. But that 2009 study is clear, in 2009, at WORST CASE numbers, our LOCAL property taxes ASSIGNED FOR RUSD could increase 10-15%. This would be roughly $200 a year on the average home. The average tax bill here in Caledonia is $3,000-3,500. What he said was completely untrue. Today, with things like Act 10 and the change to the first year funding, these numbers are likely far lower. 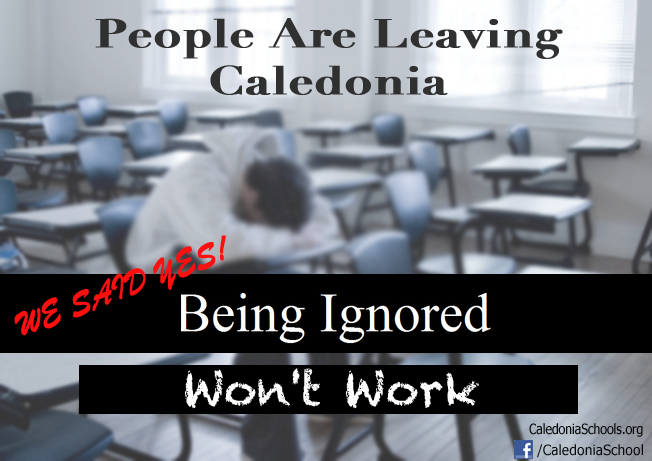 But I don’t know a single person in Caledonia that wouldn’t pay an extra $10-12 a month for a new school district. My only conclusion is that Rep. Thomas Weatherston, out of his lack of interest in this movement is deliberately saying the most negative things he can and influence people to vote against it. He is not being a leader, he is not listening to the people, and he has blocked us or slowed us down at every turn. Even a conversation with a neighboring assembly person revealed that Mr. Weatherston didn’t try to sell them on the merits of this proposal, but actually scared them by ONLY saying it would mess up our constitution and boundaries. Please do not fall for this misinformation any longer. And on such an important issue, PLEASE do your homework. PLEASE research the numbers. PLEASE contact Speaker Vos and Senator Wanggaard, who has been the most supportive to learn about their proposal to make this possible. As a trustee of our village, this is fundamental to being in the seat you hold, and I’m asking you to do it. We have started raising money ourselves to pay for the study, and have raised enough for a healthy retainer. I hope the village board comes together and revisits this proposal and agrees to fund the rest.